Yesterday was a blustery day blowing swirls of the light snow and the tree branches! With our snow covered streets it was a Norman Rockwell winter picturesque morning. Perhaps his paintings and illustrations quickly come to mind, because Stockbridge, MA is a little over an hour's drive west from our home on the MA Turnpike. It is a fav road trip to visit this very familiar museum filled with his works. While the snow was blowing outside, we were very comfortable indoors. The computers, the cell phones and the iPad were in constant use. The question of the morning: Would the Metro-North travel resume to NYC, anytime soon? Breakfast was quick and yummy! Whenever our freezer's supply of muffins is gone, (and it was gone) there are always Craisin Raisin Twists. 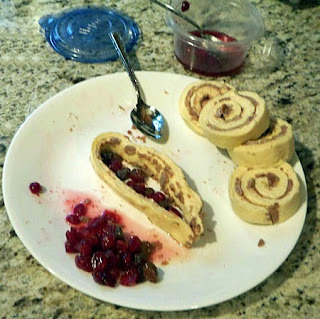 :) Previously, I have posted about my fam's happiness of biting into a Pillsbury Flaky Cinnamon Twist that is filled with Plumped Raisins/Craisins. Usually, I soak the dried fruit in Apple Juice for added flavor. However, last week there was no apple juice to be found in my home. However, we live in New England and cider is a staple in our fridge! Cider it was! 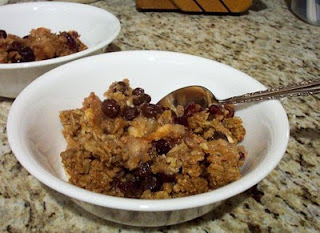 Yummy, I learned that Apple Cider gives Craisins & Raisins a nice tangy flavor. In a 1 cup container (with a lid) fill 1/2 full with Craisins and/or Raisins. Pour Cider to cover dried fruit and place lid on top and into the fridge. I use a 1 Cup Ziploc. 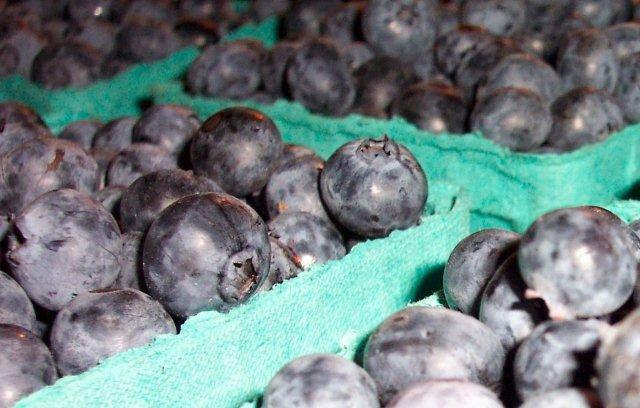 Store in fridge for 2 days and the plumped fruit will be ready to use. This stores well about 2 weeks in the fridge. As of yesterday morning we are liking the tang of Craisins & Raisins that have been swimming in Apple Cider. The Flaky Cinnamon Twists were baked following the package directions (and until lightly browned) and adding 6-7 plumped Craisins/Raisins in the middle of the dough before twisting. A quick and yummy breakfast included Cheesy Scrambled Eggs, half a Grapefruit & Coffee. This coming weekend enjoy the company of your family and friends! 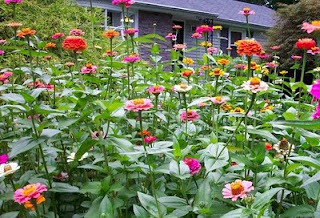 It is a special time of year that allows us to take a step back and appreciate the wonderful things that we all have. 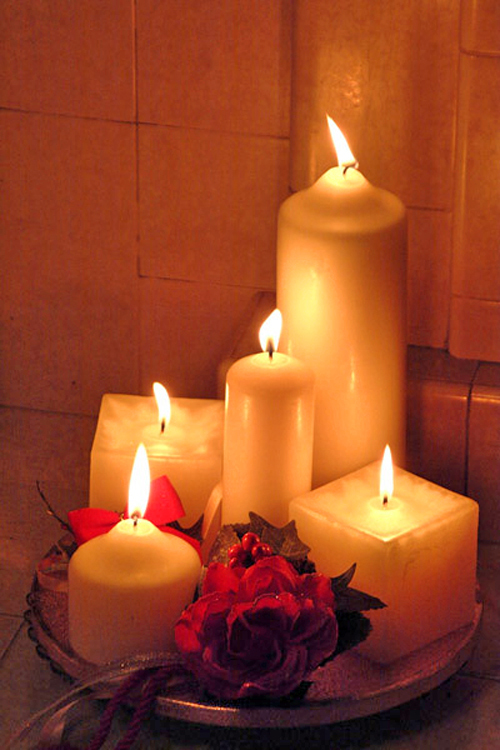 Peace to all and Merry Christmas!!! 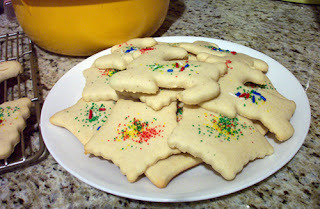 Ah, Sour Cream Sugar Cookies! The Nutmeg makes them taste so yummy! Can you tell they are my favs? 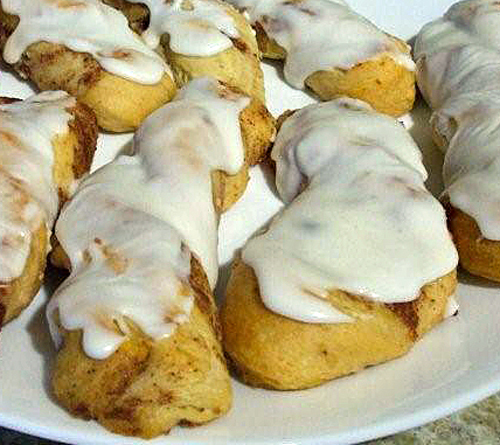 I really like baking these and also eating these. They are the best Sugar Cookie I've ever tasted. For that reason I bake them every year for special occasions. My cookie cutters are ready! These delicious light cookies are made in two steps. Day 1 make the dough. Wrap and refrigerate. 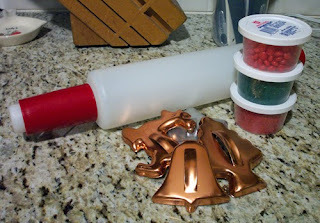 On Day 2 the colored sprinkles are taken out of the cabinets along with the rolling pin and the cookie cutters. Then, the fun begins! Nibbling on a warm cookie that is cooling on the rack is the best. These cookies are great AND they freeze very well. Tomorrow the dough will be prepped. In large bowl with electric mixer beat Butter and Sugar until light & fluffy. Add in Baking Powder, Baking Soda, Salt & Nutmeg. Add in Vanilla & Sour Cream, still beating on Low. Then beat on Medium until well combined. Dough will be stiff. Remove dough from bowl and place on sheet of plastic wrap, fold. Place wrapped dough on sheet of aluminum foil and wrap well. Bake 10 - 11 Minutes in 375°F oven. Bottom of cookies will be a light golden brown. Remove with spatula to wire racks. When cool, store in airtight container. Cookies can also be placed in freezer. I always sample a cookie or two. It's all part of "quality control". Sour Cream Sugar Cookies are just the best! The Yams were prepared first, because I coated them only with Olive Oil (for sauteing & baking). 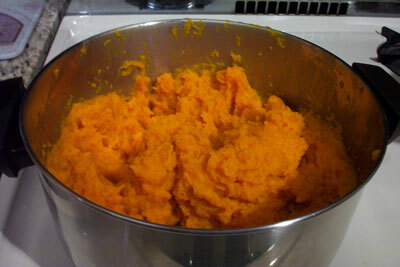 After washing the two Yams, they were cut into 3/4" slices. Place in a Gallon Sized Ziploc Freezer Bag containing 3 Tablespoons of Olive Oil. Place Yam slices on the outer edges of the large cookie pan. 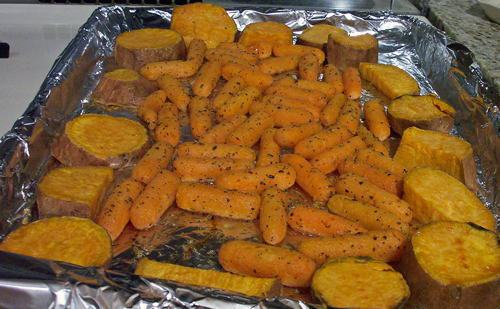 Tongs work well to place the coated veggies on the baking pan. :) No sticky fingers. Wash a 1 lb. bag of Baby Carrots in cold water. Add 1/4 teaspoon Oregano, 1/4 teaspoon Basil, 1/4 teaspoon Garlic & 1/4 teaspoon Black Pepper to the Ziploc Bag. Place Carrots into Ziploc Bag and coat with the Olive Oil & Herbs. Place the Carrots in the center of the cookie pan. Roast 30 - 35 Minutes at 425°F. Prick with a fork to determine tenderness. Not only did my home have a wonderful aroma of herbs, but the heat coming from my oven was very welcome on a cold December day! :) Dinner was delicious! 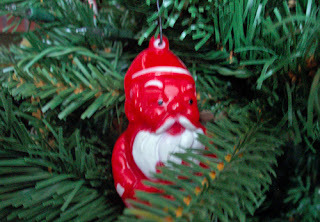 This cute little Santa ornament hung on my family's Christmas Tree when I was a youngster. Fortunately, there were Santas remaining in the set, so my sons each have one to hang on their trees, also. :) The holidays are approaching and it's time to get some Fam Fav goodies baked and into the freezer! CranOrange Coffee Cake is scrumptious, moisty and colorful. The original recipe called for Ocean Spray CranOrange Relish. However, for the past two years I have been unable to purchase this ingredient, so I've found a good substitution: About 8 ounces from a can of Whole Berry Cranberry Sauce plus 1 and 1/2 teaspoons of Orange Extract. Combine together and use. 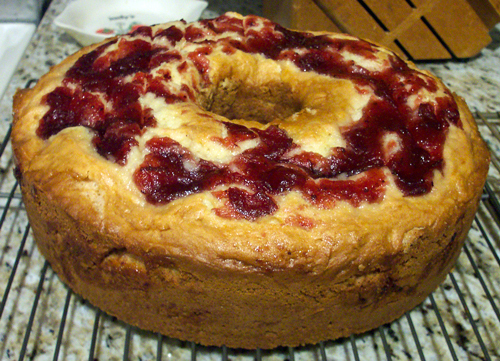 The cake is baked in a Bundt or Tube Pan. After baking & cooling, wrap in foil and freeze until the day before serving. After removing from freezer, unwrap the cake and place on a special dish. Drizzle the Almond Glaze on top. A small scoop of Vanilla Ice Cream served on the side is a tempting addition. Yummy! Add 1 Egg + 2 Egg Whites (or 2 Whole Eggs) and blend well. Combine 8 ounces Whole Berry Cranberry Sauce with 1 and 1/2 teaspoons Orange Extract in separate bowl , if needed. Blend 3/4 Cup Confectioner's Sugar, 2 Tablespoons Water and 1/2 teaspoon Almond Extract until smooth. Do you have a family favorite that your family enjoys during the holidays? So often when I am baking the aromas of Cinnamon and of Nutmeg float from my kitchen to the other rooms in my home. In desserts or in warm cereals when the weather is chilly, these are two of the spices that I often use. 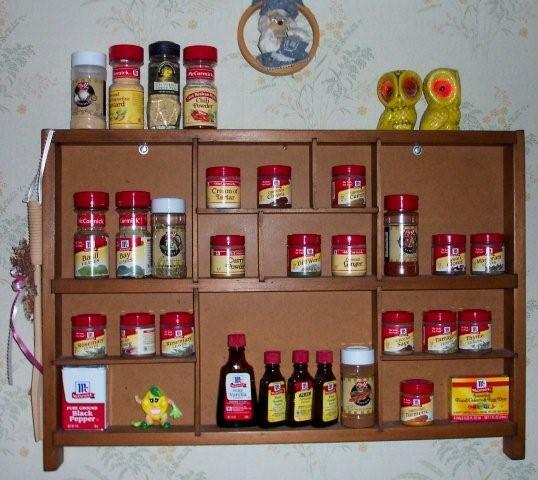 Now, my Spice Rack contains mostly McCormick containers of savory fragrant useful baking ingredients. 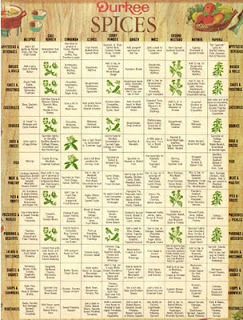 On the back of my kitchen door hangs a double sided Durkee laminated chart that has always given me quick info about what herbs and spices would work well with various foods. 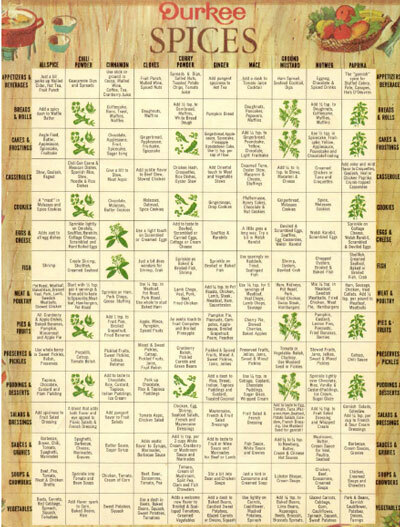 The printed charts are no longer mailed as incentives to cooks. Mine is still used and is probably 30+ years young. It's been a part of my kitchen for a loong time. However, it's great to visit a website with the History & Facts! Just Remember the Cranberry Sauce!!! However, it is customary on the second day after Thanksgiving, we will dine on Turkey a la King for our main meal. Small bits of turkey along with carrots and peas in a creamy milk sauce placed over toasted oatmeal bread. It's a much easier version of Turkey Pot Pie. Is it easy? You might ask. Oh, it's very simple to prepare. And also quick! Just remember the Cranberry Sauce!!! Return to heat and slowly add in Chicken Broth and Milk while slowly stirring constantly. One never knows who/what the source of a delicious recipe may be! Quite a few years ago one of my sons arrived home from school one afternoon with a RECIPE. On this particular November day his school librarian had read a Thanksgiving story to his first grade class. Maggie & her grandmother lived in New England near a cranberry bog. We lived in MA, so the story had kept his attention! Her grandmother baked delicious Cranberry Bread. Printed in the book was a recipe for the Cranberry Bread with the instructions "Get Mother to help". My son's kind librarian had given each student a copy of the recipe to bring home to mom. There were bags of fresh Cranberries in our fridge, because Thanksgiving was the following week. That weekend we baked Cranberry Bread using "his" recipe. 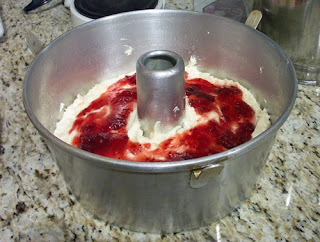 From that day on it became the recipe we would always use for Cranberry Bread. It makes one mighty fine bread! It also fit my requirements for a dessert recipe - the Sugar content was much less than the required Flour. From the first time we baked this delicious moisty bread, I substituted 2 Egg Whites for the 1 Whole Egg. 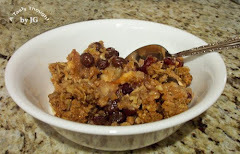 The original recipe called for Golden Raisins and I have never used Raisins, only Cranberries. 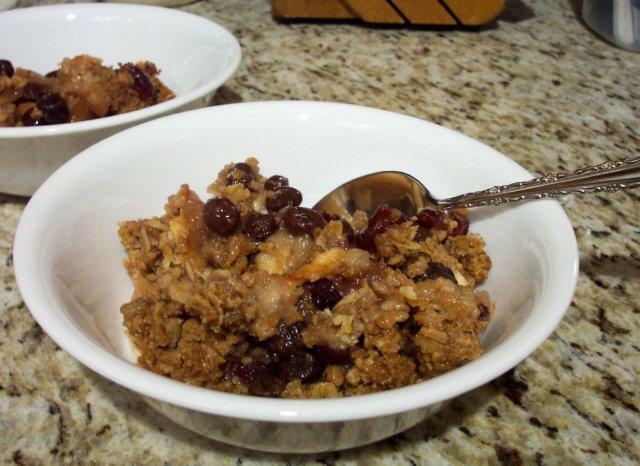 The recipe that became a family favorite was printed in the book Cranberry Thanksgiving by Wende and Harry Devlin. The book is no longer printed, but the included recipe is still enjoyed by my family. :) It makes one delicious, colorful, tasty, moisty bread. I usually double the recipe and bake two. Spray a 9x5 inch loaf pan with PAM. Add chopped Cranberries to batter and Fold in. Wait at least 5 hours after it has cooled to eat. Two days before Thanksgiving I will be baking two Cranberry Breads. It is the best!!! Yummy! Do you bake Cranberry Bread to enjoy on Thanksgiving? After mashing the last batch of the Butternut Squash chunks that were in the large pot, 1 Cup of this tasty, orange veggie was refrigerated. I had plans ... Muffins! 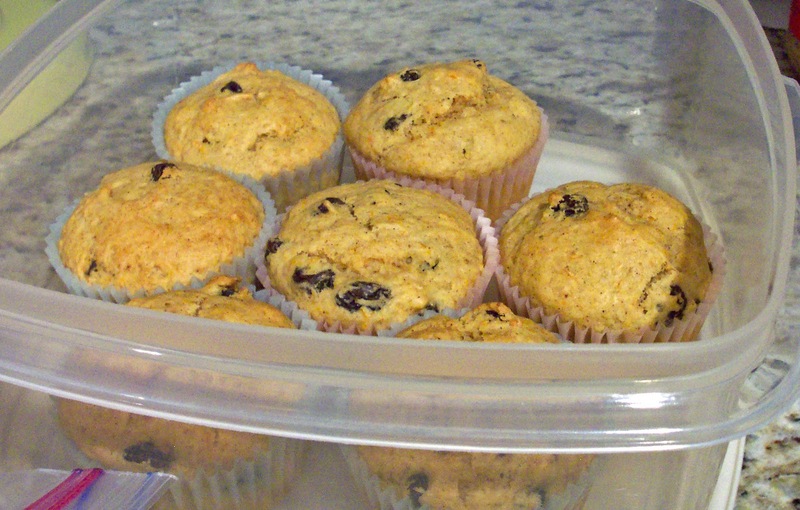 Specifically, Butternut Squash Muffins - Yummy! During the month of November (especially before Thanksgiving) one of the ingredients in some of my baked goodies is Butternut Squash. I learned this habit from my mom. 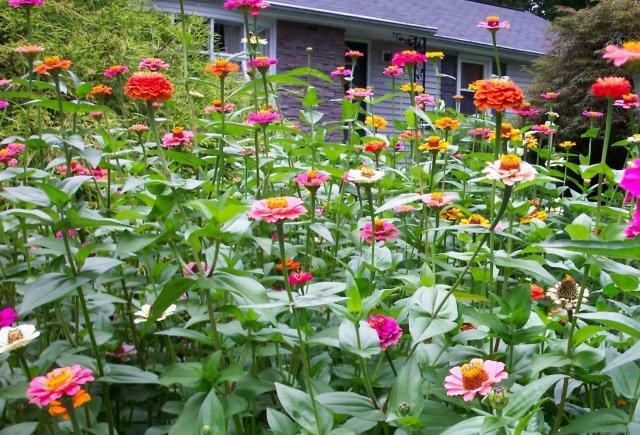 While growing up my fam had two large gardens. Oh yes, Butternut Squash was one of our cherished veggies. My mom did not bake goods with Pumpkin, but always substituted it with the plentiful orange colored tasty Butternut. To this day, I still prefer using it. I have used Pumpkin to see how it would taste/work, but discovered my mom knew what she was talking about. Butternut Squash it is! It's a great ingredient in muffins! The next day my 2 muffins pans were put to work. One batch of these tasty treats requires only 1/2 Cup of Squash. However, let me tell you whenever I am happily working in my kitchen, I seem to use many utensils and there are splatters in unusual places. :) So whenever I bake muffins, my rule is to make a double batch. Sometimes, it may take an extra couple of minutes in the oven, but my freezer will be well fed! 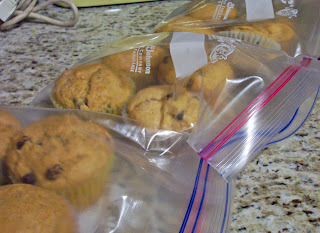 It's always great to open the freezer door and locate a package of homemade muffins. Yummy! A few years I started using Egg Whites, Soy Milk & Olive Oil as substitutions for Whole Eggs, Milk & Vegetable Oil/Butter or Margarine (melted/cooled) whenever possible. Keeping in mind that 2 Egg Whites equals 1 Whole Egg. 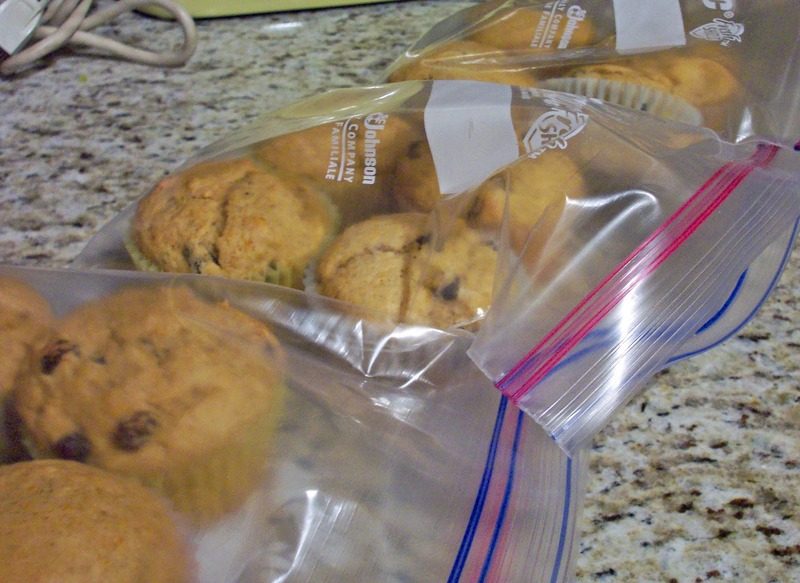 Place muffin liners in muffin pan. Combine first 6 dry ingredients. Stir to mix. Add Soy Milk (Milk), Olive Oil & Butternut Squash to Egg Whites, stir. Pour the liquid ingredients into the dry ingredients. Mix all ingredients until moistened. Batter will be lumpy. 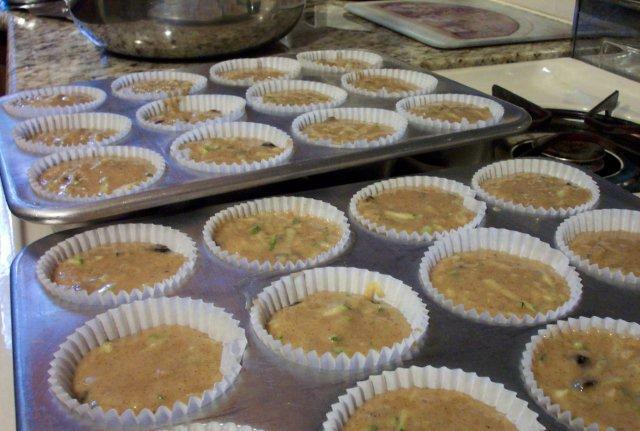 Fill muffin cups by evenly dividing batter. Bake 18 - 20 minutes in 400°F oven until muffins are lightly browned on top. Double batch may take up to 4 additional minutes. Remove muffins from pan immediately. Do you bake using Butternut Squash as an ingredient? When making muffins do you bake a double batch as long as the utensils are being used? Do you purchase an extra bag of Flour or Sugar if it is on sale during this time period? Steaming, orange, mashed Butternut Squash! My family's fav fall vegetable! Now, it will be the fav veggie of spring, also, if I start to tackle that bushel of Butternut Squash that has been sitting patiently on our garage floor. :) The time has come... As our temperatures at night have decreased, I realize that it is not wise to let those light orange colored beauties sit on a cold concrete floor. So, it was time to get moving and prep those veggies for the freezer. 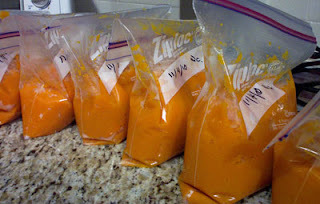 Portions of mashed Butternut Squash were placed in Freezer Ziploc Bags and placed in our freezer to be enjoyed throughout the winter/spring. After adding cold water (to reach up about 2" in the pots), the heat is turned up to High. After a Boil is reached, lower the heat and simmer about 13 - 15 minutes, until pieces can be pierced with a fork. 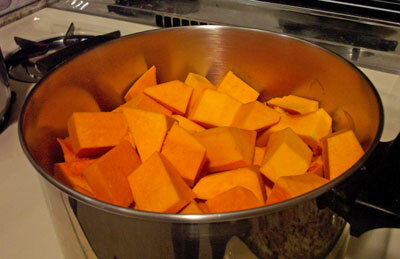 During the cooking minutes, stir the Squash pieces in the pot, so they soften equally. After draining the squash using a colander, return the chunks to the large pots and mash. I pack about 2 Cups of mashed Squash in Ziploc Freezer Bags. After labeling, store in freezer. Whenever desired for dinner a bag is unwrapped and the frozen chunk of squash is placed in a Corning Ware container with a lid. Reheat in the microwave. Easy does it! Yes, squash can be purchased already mashed and boxed & frozen ready to heat. I've seen boxes containing a mixture of various winter squashes that need butter/margarine or brown sugar/maple syrup for flavor. I am really not into adding sweetness to veggies to help make them more tasty, but would rather save any desired sugar for dessert. We are very fortunate here in Western MA - Butternut Squash is readily available to purchase when the harvest is ready. I usually purchase them at Meadowbrook Farm. Do you enjoy Butternut Squash? At other times of the year in addition to Thanksgiving Dinner? 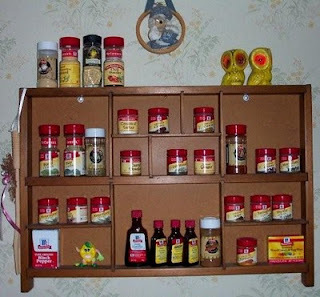 My wooden Spice Rack has been a handy staple in my kitchen for over three decades. :) It's located on the wall and is my "go to" area whenever I am adding herbs &/or spices while cooking. 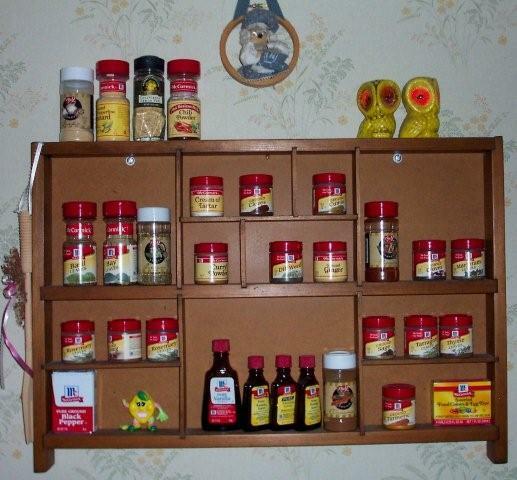 My DH had listened to my specifics for a Spice Rack, built it & stained it. 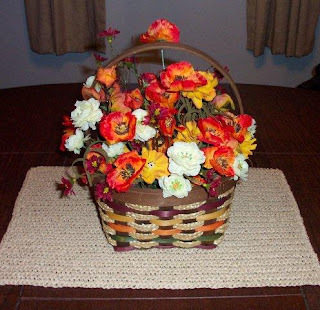 Spaces for tall & short containers were included, much like a shadow box. Today, I took a quick glance at the tall container of Chili Powder. Plenty! The Chili Powder will be used on Sunday for Red-Hot Chili. Now that our evenings are a bit more brisk, nothing beats a warm bowl of hot Chili topped with a little Sour Cream and a slice of Rye Bread at dinner time! My West Bend Slow Cooker will be used once again. This small appliance is so handy. Requiring about 15 minutes prep work always results in one no fuss, fragrant, nutritious, hearty dinner. Yum! And quite often there are more servings remaining in my slow cooker's pot! Now, that is an added bonus. Chopped Parsley (dehydrated) - 1 TBS. ***Quite often I reach into my freezer and take out a little bag of Green Pepper strips to add while placing the ingredients in the pot. Spray cooking pot of Slow Cooker with PAM. Brown about 1 lb. Ground Beef in a frying pan. Place browned Beef in Cooking Pot. Pour (1) can Diced Tomatoes on Beef. Drain, rinse in cold water & drain again (2) cans Red Kidney Beans. Place Kidney Beans on top of Tomatoes. Sprinkle on desired amount of dehydrated Chopped Onions & Chopped Parsley. Then sprinkle on Chili Powder, Garlic Powder & Oregano. Add Green Peppers, if desired. Pour Tomato Sauce over top & spread. Set temperature to High for 2 and 1/2 hours. Then, reduce to Medium for 1/2 hour. Before serving, stir the Red-Hot Chili. Your family will know dinner is ready. :) We enjoy a spoonful of Fat Free Sour Cream on top. And Rye Bread on the side! 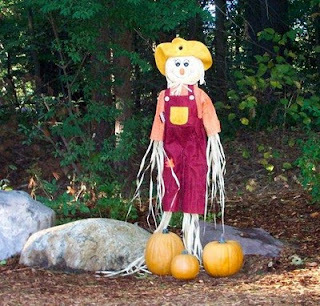 Every fall during mid October our Halloween decorations find their way out of hibernation. At this time of year I also always remember the Halloween Sherbet Punch. It's a yummy, frothy, orange beverage that we, especially my sons & their friends, would always enjoy whenever our family and friends (both young and old) got together. Our punch bowl's ladle would be in constant use. The stack of cups would need to be replenished. And ... the punch bowl's ingredients, too. :) There are two ingredients to this delicious brew: Orange Sherbet & 7-Up Soda. O.K., I use the Diet 7-Up to save a a few calories here. The quantity of needed ingredients depends on number of guests. In large punch bowl place 1 Quart Sherbet. Pour (2) bottles of 7-Up Soda in bowl, pouring some over Sherbet. Stir a little to mix. Results in frothy, softened Sherbet. Ladle into cups, adding some of the Sherbet. Replenish the 7-Up & Sherbet, as needed. Your goblins will enjoy what you have brewed! What a great sunny Columbus Day Weekend it was! The chilly mornings and the orange pumpkins went hand in hand along with the yearly ride to Meadowbrook Farm in East Longmeadow to purchase the "bushel of Butternut Squash"! What a wonderful time of year in Western MA! For me it also marks baking the first Apple Crisp of the season with the local crisp Cortland apples. A slice of homemade Apple Pie always tastes great, but if there is no time to roll out the pie crust, Apple Crisp it is!!! Raisins & Craisins (dried cranberries) mixed in with the apple slices before the baking dish is placed into the oven. :) The aromas of Cinnamon & Nutmeg coming from my oven always linger on... 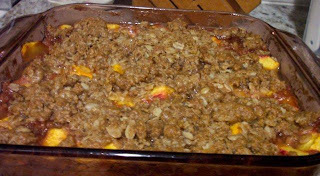 The rose colored Pyrex baking dish is used so often filled with seasonal goodies. Yummy! The servings of Apple Crisp above only need the large scoop of vanilla ice cream. Mmmm! Spray 8"x8" glass pan with PAM. Combine dry Topping Ingredients in small bowl. Measure Butter/Margarine and place on top of dry ingredients to soften. Peel + slice Apples. Place in glass pan. Add Raisins & Craisins. 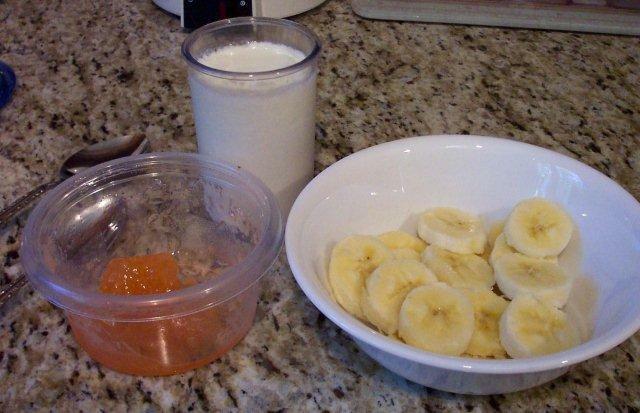 Mix with Apple slices. Mix softened Butter/Margarine with dry ingredients. Sprinkle mixture over Apple slices. 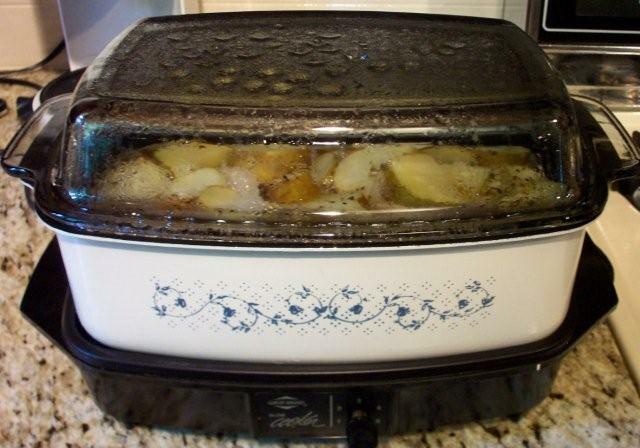 Bake in preheated oven for 45 Minutes or until apples are tender. After baking, pierce center with a fork to test for "doneness". Bake additional 5 minutes, if needed, test again. Serve warm or chilled with a scoop of Vanilla ice cream. Do you bake desserts containing Apples? With Oats? Cupcakes are a dessert to be enjoyed on special occasions or "just because". Quite often this past summer while I browsed through magazines, read articles and read other blogs, Zucchini Cupcakes with Cream Cheese Frosting recipes were appealing to and baked by many individuals. I was ready to enjoy the taste of Zucchini as a dessert once again. It has been a few years. :) Perhaps it'd be a good idea to ignore the Cream Cheese Frosting with the additional calories. I located many and baked three different recipes. 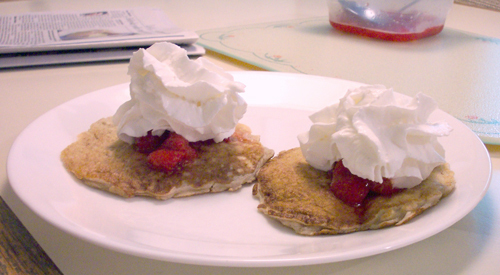 Each recipe I tried contained a lesser amount of sugar - it's that calorie thing, once again. The last recipe that I baked (and have done many times this past summer) was located on allrecipes.com Janet Pierce shared a recipe, Zucchini-Chocolate Chip Muffins that results in moisty delicious muffins. Thank you! She also shared that she freezes these muffins. That was a selling point for me. This past week there were two green Zucchini in my fridge. 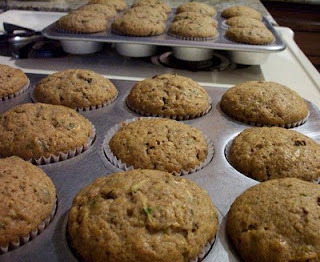 Considering that autumn has arrived, what better way to use these Zucchini than make a double batch of Zucchini Muffins? I now use Janet Pierce's recipe, but do not include the chocolate chips nor the chopped walnuts. I also substituted Egg Whites (2 Egg Whites equals 1 Whole Egg when baking), Olive Oil for Sauteeing & Baking and Soy Milk. In my family it's always "all about the Raisins", so I added 3/4 Cup Raisins. Plus about 1/8 tsp. Nutmeg. A double batch of the Zucchini Muffins was baked with two-thirds of the baked goodies placed in my freezer. The total baking time for 24 muffins was 28 minutes.